Many of the seafood from March are still in season in April. The cold waters still bring fish rich with fat that shines in sashimi or is nice for grilling. 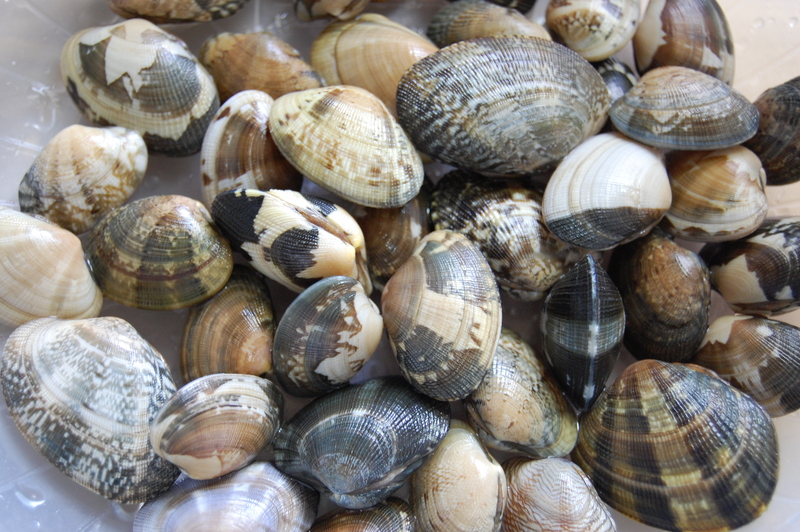 Asari clams are great for making into a quick vongole style pasta. Grilling salted fish heads of buri or tai is quick and simple and the perfect accompaniment to sake or shochu. Bitesize tiny hotaru ika can be quickly blanched and then served with a sweet and vinegary sumiso dressing. Nishin can be salted and grilled. And perhaps my favorite this time of year is katsuo simply seared on the edges, sliced thickly, and served with some soy sauce and garlic. Katsuo tataki is particularly nice if you can garnish it with fresh myoga. Hirame is lovely as sashimi. If we have leftover hirame sashimi Shinji likes to cure it in kombu overnight at kombujime hirame. The texture changes as the umami is soaked in from the kombu to the hirame. Hotate we like as sashimi or cooked meuniere style. Takikomigohan of scallops is also a nice change-up. Mebaru is a light, white fish that is nice as himono. While tachiuo may look intimidating in the market, it is a delicate fish that can be grilled meuniere-style. And, for the perfect sake snack in spring, I love deep-fried wakasagi.